If the Police arrest a person with mental health problems in connection with a killing – they will be given an examination by a psychiatrist to see if they are fit to be interviewed and whether they can understand what is going on. Depending on the outcome of this examination the accused will either be questioned (or not) and then if formally charged, they will be sent to prison on remand or to a secure unit at a psychiatric hospital whilst the case is being prepared. Further tests and investigations into the patient’s mental state at the time of the incident will usually be carried out then. If the accused is fit to stand trial, they will attend a brief hearing at a magistrate’s court shortly afterwards – which will just confirm their identity and the offence they are actually charged with. The case will then be handed over to the Crown Court to be heard in due course. When the Police have completed their investigation, they will pass their files to the Crown Prosecution Service (CPS) who will then decide if there is enough evidence to prosecute the case. It’s not unusual for this process to take up to a year – or more – before it comes to trial at the Crown Court. Separate psychiatric reports for both the defence and prosecution will be carried out. During this time there may be a number of court (case management) hearings which confirm that the legal preparation of the case is advancing and also ensures that the accused is being held in prison lawfully – they haven’t been forgotten about. These hearings are open to the public and the defendant should be present if they are deemed well enough. The CPS decides whether the accused will be charged with murder or manslaughter. In very broad terms murder is when someone knew what they were doing and they intended to do it. Manslaughter is when they didn’t know what they were doing or they had an ‘abnormality of mind’ (a mental health problem which limited their responsibility) or, they didn’t intend to do it. If the charge of murder stands – and the defendant pleads not guilty – then there will be a trial at a Crown court looking at all the evidence, where witnesses will be heard and cross examined. Based on that evidence a jury will decide whether the accused is guilty or not. Typically such a trial can last for several days and can reveal much information about the defendant’s previous history and care. If the charge is manslaughter – and the psychiatric evidence supports it – then typically the defendant will plead ‘guilty by reason of diminished responsibility’ which is usually accepted by the Judge. In such cases there will be a much shorter hearing, often of less than an hour, and only short reports will be read out in court. These will cover brief details of the killing itself, a brief history of the offender and evidence from psychiatric experts that the mental health problem was so severe that it limited the accused’s responsibility for the killing. There is no in-depth investigation, no cross examination of witnesses, and often not much substantial information emerges. 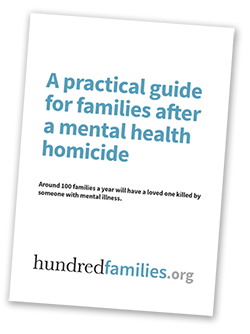 In cases where the plea of guilty to manslaughter is accepted, several families have felt let down by the short length of the hearing and the lack of information – particularly if they have waited a long time for their day in court. In some cases where the accused is too ill to understand the proceedings, after considering the psychiatric evidence the Judge may find the defendant ‘unfit to plead’. A jury will then decide on the basis of the available evidence whether the accused committed the act. If they do find the accused did commit the act, the judge can issue an order for the defendant to be sent to a psychiatric hospital under certain restrictions, for treatment under the Mental Health Act. In the defendant gets better in hospital, a decision will be taken by the Crown Prosecution Service whether they are fit to be sent back to court to enter a plea to the cahrage. (Sometimes this can be many years later). There is currently not much publicly available information on such cases. Families affected by murder or manslaughter now have a right to make a Victim Impact Statement – about the effect the killing has had on them and their families – for the judge to consider when deciding on the sentence. The Victim Impact Statement is usually put onto a police witness statement form and entered into evidence. Sometimes this statement will be read out in court after the verdict has been delivered or may be referred to by the judge during sentencing. It is impossible to put into words what the violent death of someone you loved has meant to you, but sometimes these statements can be very powerful documents. They can remind everyone in court and beyond that they are dealing with a real person who did not deserve to die, who was known and loved and is still missed terribly. If convicted of murder, the sentence is always life imprisonment. The judge will then have to determine the minimum period the defendant will have to serve before being able to be considered for parole. Typically the judge starts at a tariff for life of 15 years imprisonment and will then consider any aggravating or mitigating circumstances which might raise or reduce this sentence. Any time the defendant has already spent in custody on remand will be taken off this sentence as ‘time already served’. If a defendant is found guilty of manslaughter by reason of diminished responsibility, typically the judge will make a hospital order – sending the defendant to a high security or medium secure psychiatric hospital for treatment – for an indefinite period of time. This can sound like a life sentence and a heavy punishment – and for some seriously ill people this will be certainly be the case. But for others, especially those who had been poorly supervised and cared for in the community prior to the offence, (particularly those who have not been taking their medication), once they receive effective and high quality treatment in a secure psychiatric hospital, often they can make substantial progress relatively quickly and can manage their symptoms much better. A Mental Health Review Tribunal will then decide if they still need to stay in hospital. In some cases this can lead to their release from hospital back into the community within just a few years. Mental Health Tribunals judge whether patients in secure hospitals are being held appropriately and legally. If a patient gets better in hospital and no longer needs to be held in a secure facility they can apply to a Mental Health Review Tribunal to be released. Under the Mental Health Act 2007 victims and their families now have rights to get information about the circumstances of a convicted perpetrator in hospital and any changes in their status. They also have the right to hear about any plans, applications or conditions for their possible release. Families can also write to or appear in person before the Tribunal when they are deciding whether to release a patient. It’s an opportunity to give the families’ views about any possible release. This is arranged via the Probation service (National Offender Management Service) who will act as intermediary. There is no information currently available about how this has worked in practice, particularly from the victims’ family’s point of view.